If you wish to contact us, please send an email. NB: Bear in mind that GIR operates intermittently. Replies may be delayed. Please note that GIR does not respond to enquiries about where or how to buy gold bars featured on this website. Enquiries should be directed to the appropriate bar manufacturer or issuer. Bear in mind that most of the featured bars are only available in their country or region of origin. Grendon International Research Pty Ltd is the trading name of Grendon International Research Trust. Established in 1989. 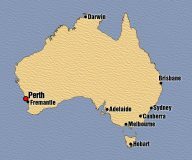 The company is located in Fremantle, a port city that is part of the metropolitan area of Perth, the capital of Western Australia. Australia is the world’s second largest gold producing country, annual gold output normally exceeding 250 tonnes. Western Australia accounts for about 70% of this total.